We Wash It Like We Own It! 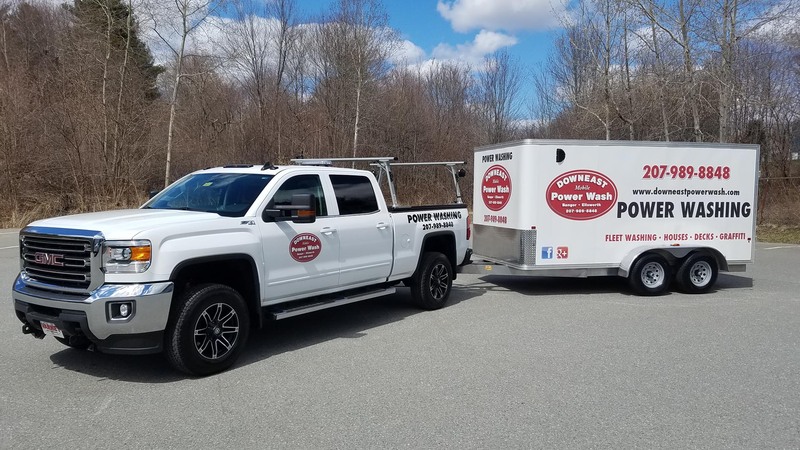 Downeast Mobile Power Wash in Brewer, ME, provides convenient and thorough power washing services for residential and commercial customers. For more than 17 years, we have provided quick and efficient mobile hot water pressure washing. We offer variable pressure and temperatures. Our certified and insured professionals bring our services right to you. We travel statewide and are eager to hear about your project. Whether you need your vinyl siding cleaned or your commercial truck washed, we will get the job done right! We take great pride in providing friendly services for all your pressure washing needs throughout the year. Let us remove the mold, mildew, and dirt off your vinyl and wood siding and roofs, plus clean your dirty, clogged gutters. Contact us today for a free quote! From the sides of your home and deck, to your commercial vehicles and roof, if it has dirt, mold, or mildew on it, we can blast it away. We make it easy for you to clean your property or vehicles because we bring our services to you. We think we are good at what we do, but you don’t have to take our word for it. Read through some of the reviews our customers have provided after taking advantage of our pressure washing services. All information provided is provided for information purposes only and does not constitute a legal contract between Downeast Mobile Power Wash LLC and any person or entity unless otherwise specified. Information is subject to change without prior notice. Although every reasonable effort is made to present current and accurate information, LinkNow!™ Media makes no guarantees of any kind.